I used CPS#104 sketch for this card's layout. Selecting paper to fit the sketch was easy -- this pretty pattern is one sheet from Webster's Hello Beautiful Journaling Cards. They are sized 4.75" x 5.50" which makes for a neat sized card, I think -- it will fit in a 5.50" or 6" square envelope. Karen Lockhart's sweet little Itty Bitty Birds seemed perfect for this "Sing and make music in your heart" sentiment on the paper. I stamped them with Memento Rich Coco ink onto some plain tan colored Webster's paper and colored them with Copic markers R20, R39, BG10, BG13, E00 & E13. I punched them out with a 1-inch square punch and mounted them onto an Inchie Arts White Inchie Square -- this gives the focal point prominence on the card and gives it nice dimension. The burgundy dotted paper is more from Webster's regular Hello Beautiful collection. For the lower right horizontal element to the sketch, I just cut a slit in the paper and tied my favorite cream silk ribbon around the heart in the patterned paper. Card base is Prism Razzleberry Dark. Lockhart stamps, Memento ink, Copic markers, Inchie products available from Ellen Hutson LLC. Webster's papers & silk ribbon available from StarLitStudio. Sorry I haven't been around much this week -- last Sunday afternoon I debated on whether to take a nap or weed the flowerbeds and decided on the flowerbeds. I should have taken the nap, because I threw out my back again while working in the yard -- ugh! Then Tuesday was my birthday -- nothing like not being able to get around because of a bad back to make you really feel your age on your birthday, LOL! It's much better today though -- I was finally able to sit at my desk last night and make this card. As you may have read on Beate's blog this morning, we are doing the Weekend Sketch Challenge a little differently now. Each person on the team will rotate and take turns creating and hosting the challenge. This week, it's Lori's turn -- you can see the sketch on her blog and post a link to your creation there. Next week it's my turn, so I hope you'll stop in here to see what I have for you! I used EK Success' new Dotted Wave Edger punch (found at Michael's) for the strip to the left of the gumball machine and machine stitched around the focal image. All patterned papers are from Basic Grey's Cupcake collection. The long red tag is a Spellbinders die and that great "Live each day" sentiment is also Karen Lockhart's. Ribbon is Papertrey Ink's Lemon Tart satin. I hope you'll stop by these talented ladies' blogs to see the samples they created for this sketch and participate in the challenge this weekend: Beate, Cami, Charmaine, Jenn, Lori and Mary Jo. I'll be back tomorrow with some more creations! These Spring trees are in bloom over at the CLASSroom today -- I hope you'll join me there to see how I created this 6-inch scrappy refrigerator magnet using a cool technique with Flower Soft! Watercoloring started out as my most favorite coloring medium for stamped images and today at the CLASSroom I'll show you how I created this card, using Tim Holtz' Distress Inks. I hope you'll join me for a step-by-step lesson on how I watercolor! The color scheme (apricot, coral & chocolate) came from the "For The Love of Chocolate" Virtual Stamp Night challenge over at SplitcoastStampers.com tonight (Friday). The challenges begin again at noon on Saturday and continue until 11pm. So come on over and join in the fun -- you could even have the chance to win a prize! I used CPS#103 for the layout of this 5.25" square card. Papertrey Ink's Dark Chocolate cardstock is the base and I just happened to find the challenge color combo in this new mat pad of patterned paper (Me & My Big Ideas) that has been sitting on my desk for a few weeks, unused yet. How lucky was that?!! The zig-zag trim was made with an EK Success' new edger punch. Papertrey Ink's Birthday Basics sentiment was stamped and die cut with Spellbinders Tags Trio. Machine stitching and Stampin' Up's wide chocolate grosgrain ribbon finish off this card. I hope you are enjoying the beginning of your weekend! It's good to be back with you on a Friday morning with a sketch challenge! Using the Weekend Sketch Challenge #69 from Beate, I used Karen Lockhart's Rosebud Cupcake and bright & cheery October Afternoon Hometown papers from StarLitStudio. The cupcake was stamped with Memento Tuxedo Black ink onto Gina K's Pure Luxury white cardstock. If you haven't tried this cardstock yet, you should! It's fabulous with your Copics and comes in two different weights -- Layering Weight (80 lb.) and Heavy Base Weight (120 lb. -- this is what I use). It's super smooth, your Copic colors blend effortlessly on it with no bleeding, and I love that the heavier weight makes such a sturdy one layer card base! I colored the cupcake flowers with Copic BG45 & B39 (using the lighter BG45 to pick up color from B39); the filler is BG34; leaves and cupcake cup are YG17 & YG63. Once again the Copic Spica glitter is hard to capture, but Sky Blue was used to accent the flowers. The zigzag white edges were made with Marvy's Paper Trimming Buddy and its Pinking rotary blade. Some wacky machine stitching accents the focal point, along with a tied Foof-a-La button from Taylored Expressions. The sentiment is also by Lockhart Stamp Company. I hope you'll check out the other sketch samples made by Beate, Cami, Charmaine, Jenn, Laurie, Lori and Mary Jo -- I'm sure they'll knock your socks off and I love seeing how different everyone's cards are! Happy Friday to you ... I'll be back with a watercoloring tutorial for you tomorrow! The "Stitched Together With Love" title blocks were made to resemble a quilt, by using Spellbinders Classic Square Nestabilities to cut out some patterned paper. I then custom made the "Stitched" and "Together" by using JustRite's Special Occasions & Times New Roman papercrafting fonts again. The "With Love" is a center from JustRite's Harmony Classic Circle Stamper II Stamp Ensemble. I faux stitched around each square, and then matted each square with Spellbinders' new Inverted Scalloped Square Nestabilities (available sometime in March). I printed the photo in sepia tones and matted it with a cut of the new 12" Grand Classic Lace Border I previewed in Spellbinders new CHA release of dies. The Tags Trio was stamped with JustRite's Times New Roman papercrafting font. The large flower accent is Spellbinders' new Dahlia flower die (also available in March). I should have some new JustRite products that were released at CHA to show you in a few weeks ... so be on the watch for those! New 2009 Copic Color Chart with Spica Glitter! I've updated my blank Copic Color Chart to include space for all the Spica Glitter Pen colors, including the ELEVEN new colors that will be available in April 2009. You can see those new colors in THIS post. Below is the Excel chart download -- it prints in 11" x 8.5". I suggest printing it onto the same cardstock you normally use for Copic coloring, so you can get a true representation of the colors. I also suggest storing the finished chart away from any direct light. I've discovered that my chart, stored directly beside the Ott light on my desk has faded a bit over the last year, so I'll be coloring a new one! For future reference, these chart links will also be permanently placed on my Copic Info Page. Enjoy! Some of you have said you can't successfully open either file. Please give me a few days and I'll try to get it into PDF format. I'll let you know when that happens. 52. Flowers for you is undoubtedly my favorite set. I like how there's a pattern that can be stamped into the vase. Very cute. I'm longing for spring so this one really hit me. Congratulations, Shari!! I've emailed you -- if you don't see that email, please email me (link located under my photo) with your mailing address and sweet Joy at Our Craft Lounge will send your free set out to you! If you have the day off, I hope you are enjoying it! I hope to stamp and have something new to show you tomorrow! Happy Valentine's Day! Here's that card I promised you, using the newly released stamp set from Our Craft Lounge -- Flowers For You that I'm giving away (provided so graciously by my friends Cami & Joy at Our Craft Lounge) two posts below this one. You still have until 10pm CST tomorrow, Sunday, February 15 to enter for a chance to win this stamp set on that post. Aren't these doodled flowers pretty? I love this whimsical style! Back with more details in a bit . . . Sorry about that -- we decided on a VERY impromptu whim to go out for a Valentine dinner with friends and I had to leave abruptly! This Cuttlebug Concentric Heart die cut was sitting on my desk and fit almost perfectly around this flower bouquet, so I decided to use the heart as a frame and cut around the flowers so they would extend over the frame -- I like happy accidents like that! I cut out the bow and popped it up with dimensional foam tape. Patterned papers are from Little Yellow Bicycle-Love Letters 6x6 decorative edged tablet. The card is 5.50" square. You could use this card for any number of occasions. I toyed with the idea of making it a birthday card, but decided to make it more of an anniversary or wedding card by custom making the sentiment "So Happy For You" with my Dymo label maker. Actually, I think you could use this for any happy occasion -- not just for wedding or anniversary! Thanks for bearing with me tonight! The Weekend Sketch Challenge / Girl Fridays are back . . . yay! We all missed having a regular get together on Friday mornings to share our sketches with you all, so we talked super-busy Beate into bringing them back. There will be a few changes, though, and we'll let you all know about those soon. Nothing will change for you, though . . . every Friday morning at 8:30am CST you'll get a sketch that you can try out over the weekend! For the next two weeks, Beate will be providing sketches for Cami, Charmaine, Jenn, Laurie, Lori, Mary Jo and myself to sample, so please be sure to check out those awesome stampers' blogs to see what they've created today! I'll be honest, I wasn't too fond of this sketc (no offense, Beate!) when I started out, but I ended up loving my card! I think these bold October Afternoon papers had something to do with that, with their common black accents. These papers can be hard to find in stock, but Cindy at StarLitStudio currently has them. A couple of tied black buttons and a Dymo tape custom-made sentiment complete this card. I hope you'll give this sketch a try this weekend (you can find it on Beate's blog) and please check out the post below this one for a chance to WIN some new stamps being released today by Our Craft Lounge! I'll be back tomorrow with a card I made with that pretty new Flowers For You set! OCL CHA Release & Blog Candy! My sweet friends, Cami & Joy at Our Craft Lounge are releasing 28 new stamp sets today! You can view them all HERE. To help them celebrate, they are letting me give away one of those newly-released sets here on my blog! Flowers For You is a beautiful cling-mounted rubber floral set with lots of possibilities! If you would like a chance at winning this set, please leave me a comment on this post telling me which of these 28 new sets is your favorite . . . that's it! Just one entry comment per person, please. You can enter until approximately 10pm CST Sunday, February 15, then I'll let Random.org choose the winner and announce it Monday morning. Your brand new stamp set will ship directly from Our Craft Lounge. If you would like the chance to win more of these new stamp sets, please visit Cami's blog to see a list of the other stamp giveaways! I'll be back a little later today at 8:30am CST with my Weekend Sketch sample! Then I'll be posting a card I made with this gorgeous floral set on Saturday . . . I hope you'll check back in! ETA: Oops, it seems most of the other 27 free stamp set giveaways from Our Craft Lounge have already ended and the winners have been posted (sorry I didn't get my timing straight on that!). So I've closed entries for this set and will post the winner tonight . . . stay tuned! Remember those pretty paper flowers HERE and HERE that I created and told you I would share the tutorial on how I made them? Well, the time has come! The tutorial will be in Ellen Hutson's InTouch Newsletter that comes out this Sunday, February 15th. 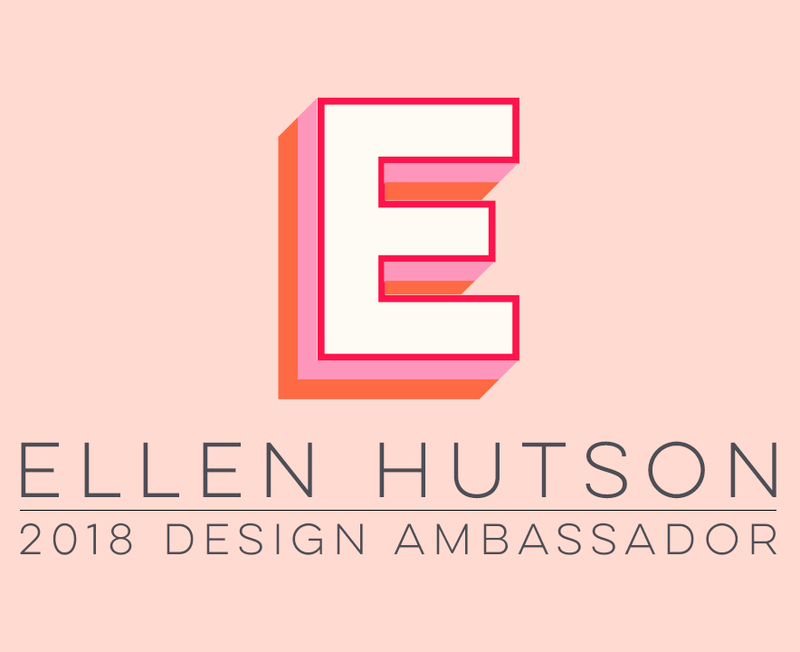 If you are not already signed up to receive the newsletter, you can sign up now by going to the very bottom of Ellen Hutson LLC's front page and entering your email address in the "Join Our Mailing List" box. I'll be back tomorrow with a Weekend Sketch Challenge from Beate . . . yes, the Girl Fridays are starting back up, after a holiday break -- yay! You'll want to be sure to check it out because I heard some blog candy will be involved <wink>! I hope you'll join me today for some non-caloric birthday cake over at the CLASSroom and I'll share with you how I created this quick birthday card! Enjoy! Unity Meets Webster's Via CPS! At CHA last month, I finally had the chance to meet most of the Unity Stamp Company team and thanks to their kind generosity, came home with a few of their darling stamp sets that I'd been wanting to try. I chose to use this sweet bird from the Hey Chick! set and combined it with some of my favorite Webster's Pages paper. This week's CPS#102 made it all happen (I flipped the sketch just a little)! I stamped the bird, using Unity's fabulous & unique acrylic/wood mounting system, with Memento Rich Cocoa ink onto Neenah Classic Natural White cardstock and colored her with Copic markers BG13, R39 & YG95, to match colors in the patterned papers. Clear Copic Spica glitter pen highlights all the red coloring on the bird. I loved the feel of the wood handle on Unity's acrylic block! I made a frame with the Cuttlebug Concentric Hearts die, placed it over my colored bird and machine stitched the two layers together. A sparkly blue button accents this focal piece. It is popped up over a layer of Webster's Pages Hello Beautiful (Love Note) paper that was cut with pinking scissors and matted with Prism Rose Dark cardstock. These layers were also machine stitched and popped up over the card's base layer of Webster's Reflections of Nature (Chestnut Mocha). The blue accent strip (Webster's Inspired-Peacefulness) at the bottom was punched with Fiskar's All-A-Fleur Embossing Border punch. This little bird is headed out my door to wish a sweet friend a happy Valentine week and I hope you all have a good one as well!